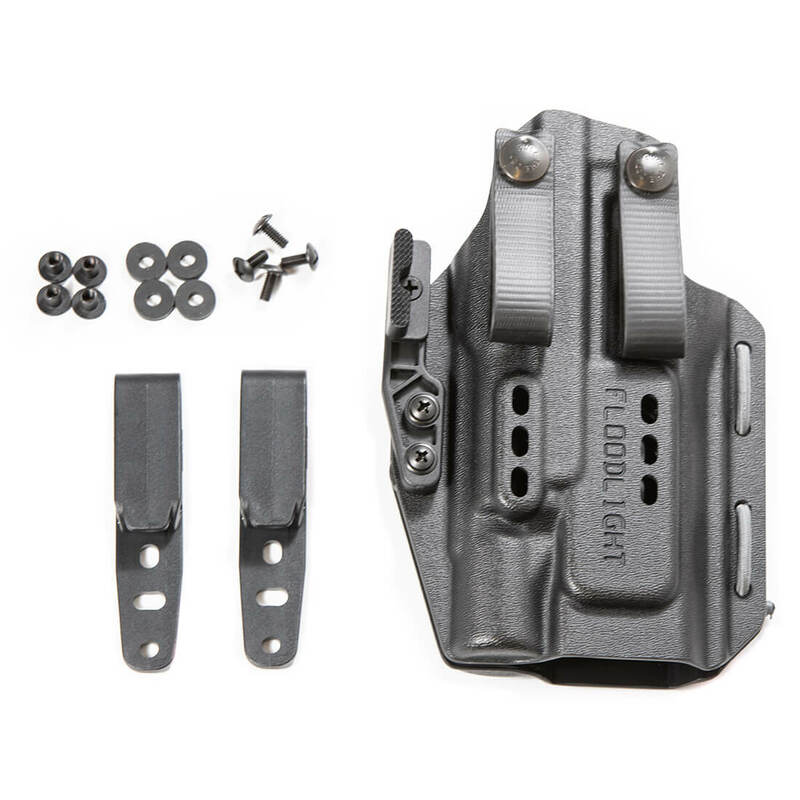 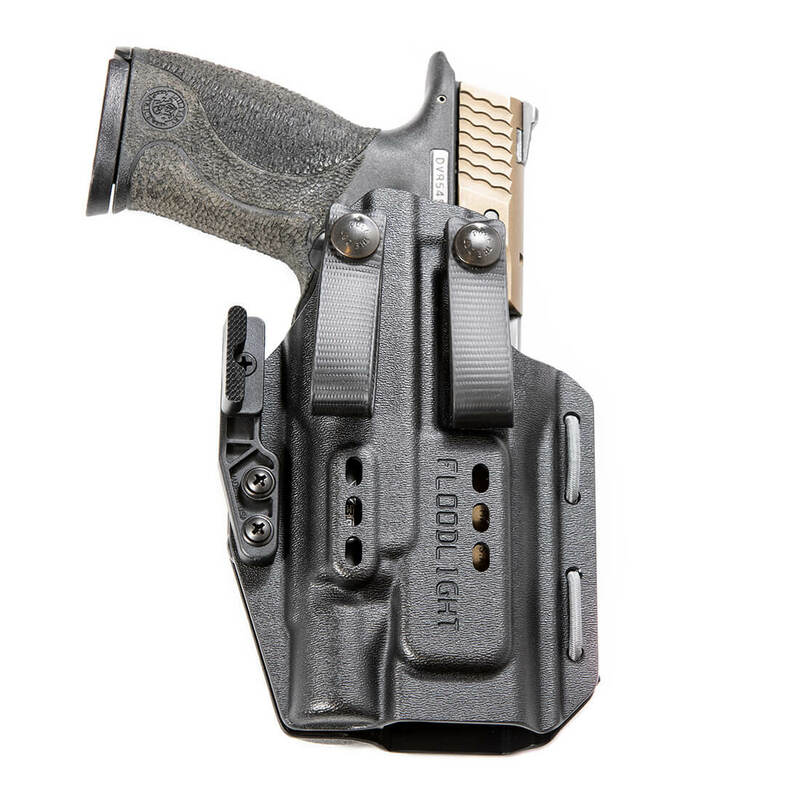 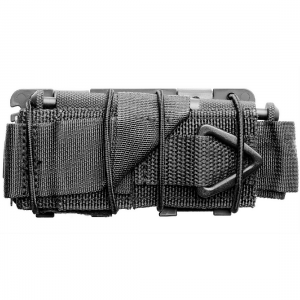 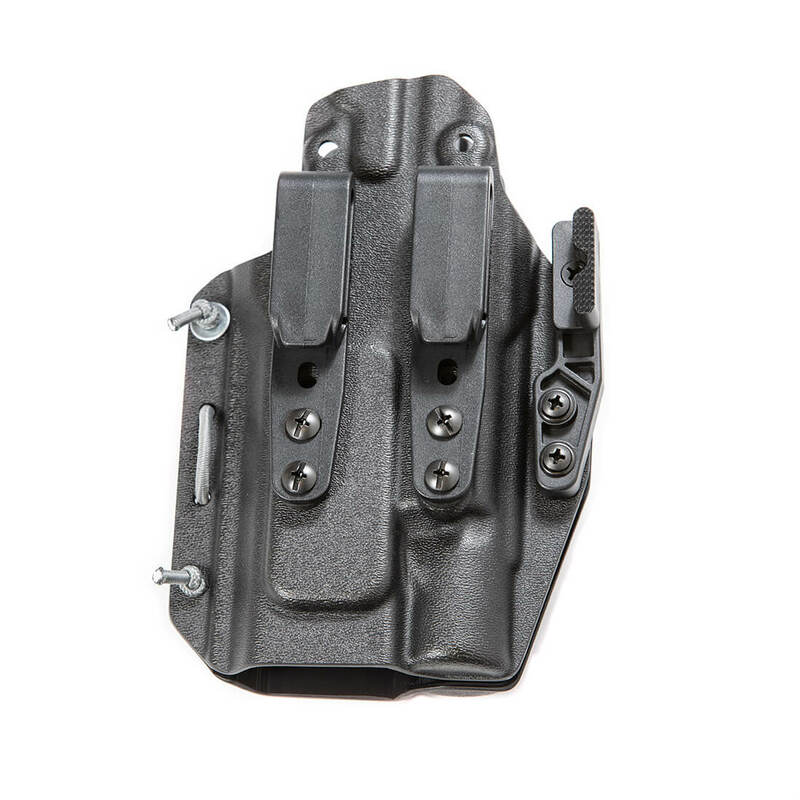 The ambidextrous Floodlight holster includes IWB soft loops and belt clips, features adjustable retention, adjustable slide-contact, adjustable ride height, and can be carried AIWB or strong-side IWB. 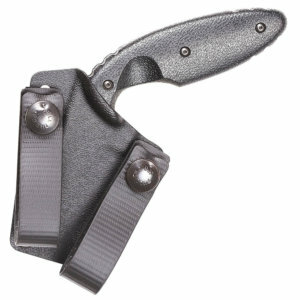 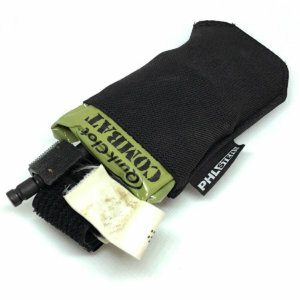 Fits pistols with the X300 Ultra, A or B, attached. 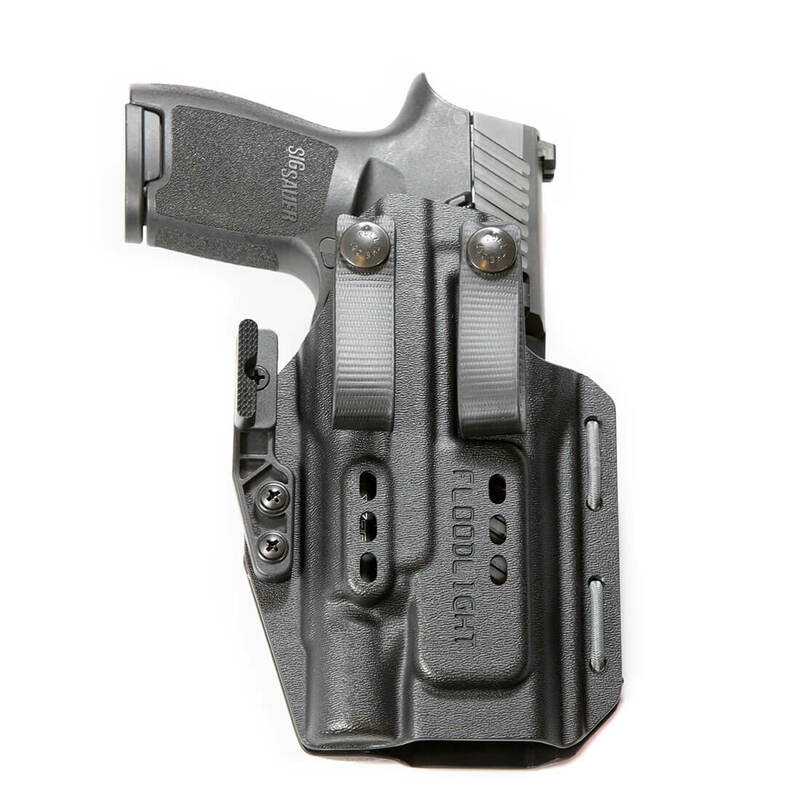 The Floodlight is a universalized holster, made to accept nearly any service-grade pistol capable of attaching an X300U A or B weapon light. 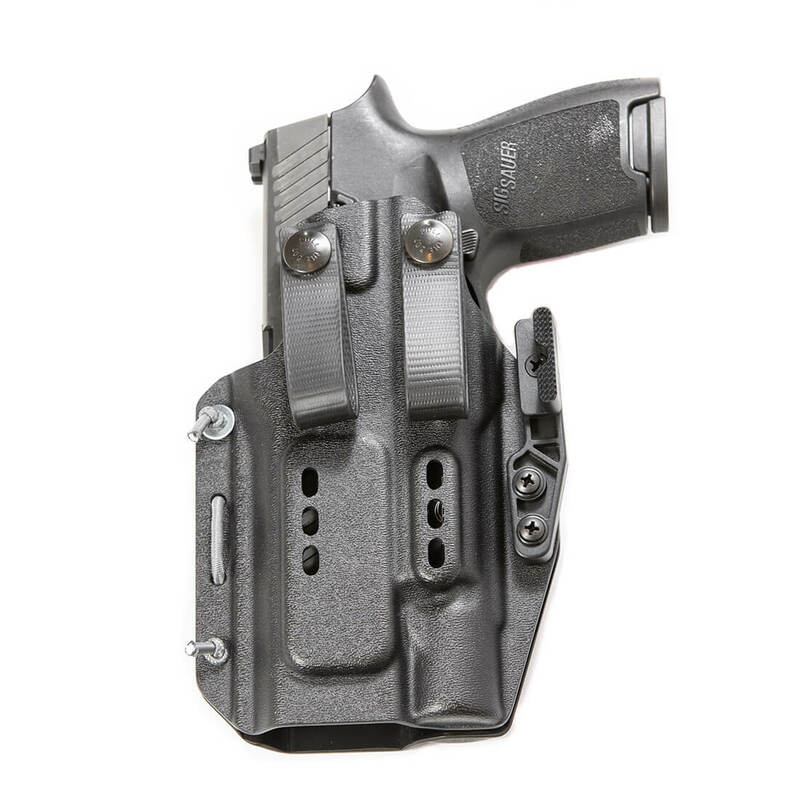 To accomplish this, many features are smoothed, radiused, and regularized to accommodate the different shapes, sizes, and dimensions of this wide array of firearms. Like the Spotlight holster, adjustable retention is included, allowing the user to increase or decrease the friction retention on the body of the WML to tune the draw to their preference. 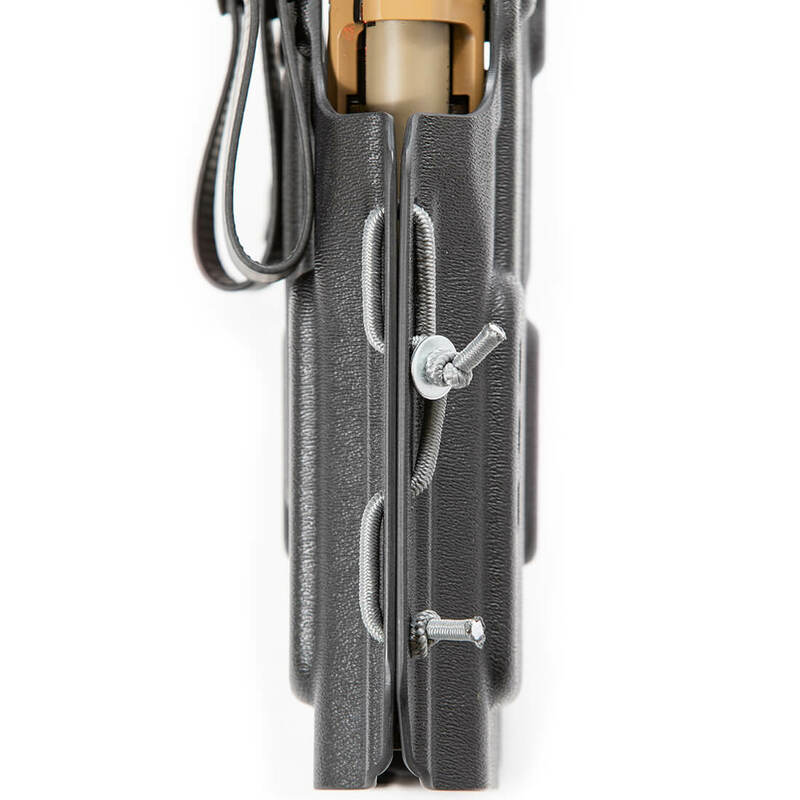 Turn the screws attaching the ModWing grip-tucking hardware to dial the retention to your preference. 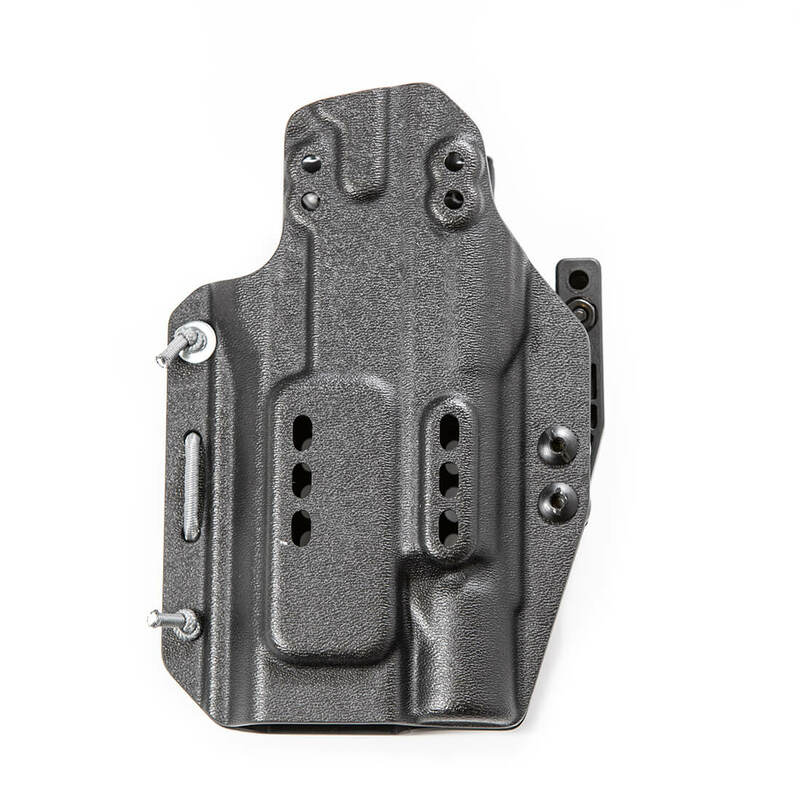 In order to ensure the best possible fit and retention across the widest variety of pistols, the Floodlight is a two-piece design, like the Skeleton holster, but features adjustable slide contact. 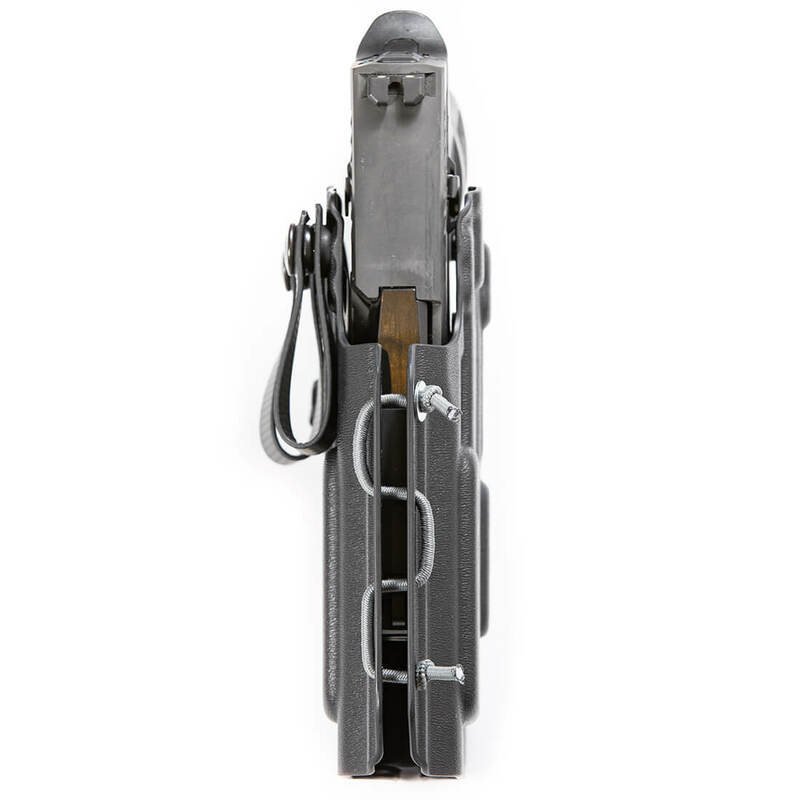 By shortening or lengthening the shock cord connected the two halves, users can reduce or eliminate play, rattle, and slop when switching between guns that have different slide dimensions. 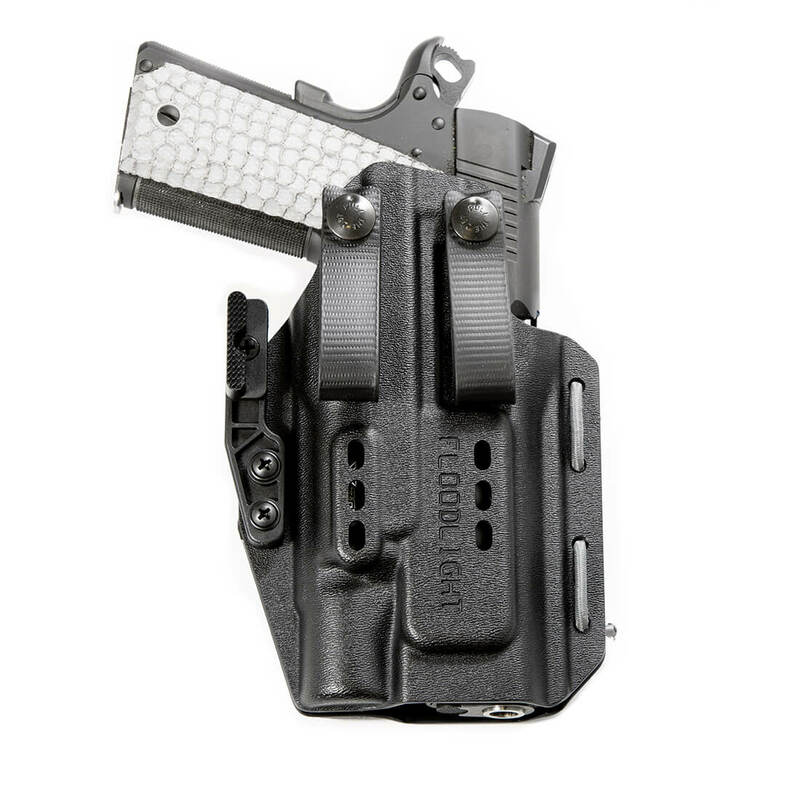 The Floodlight, like the Skeleton, is ambidextrous and can be worn AIWB or strong-side IWB, using either soft loops or clips (included). 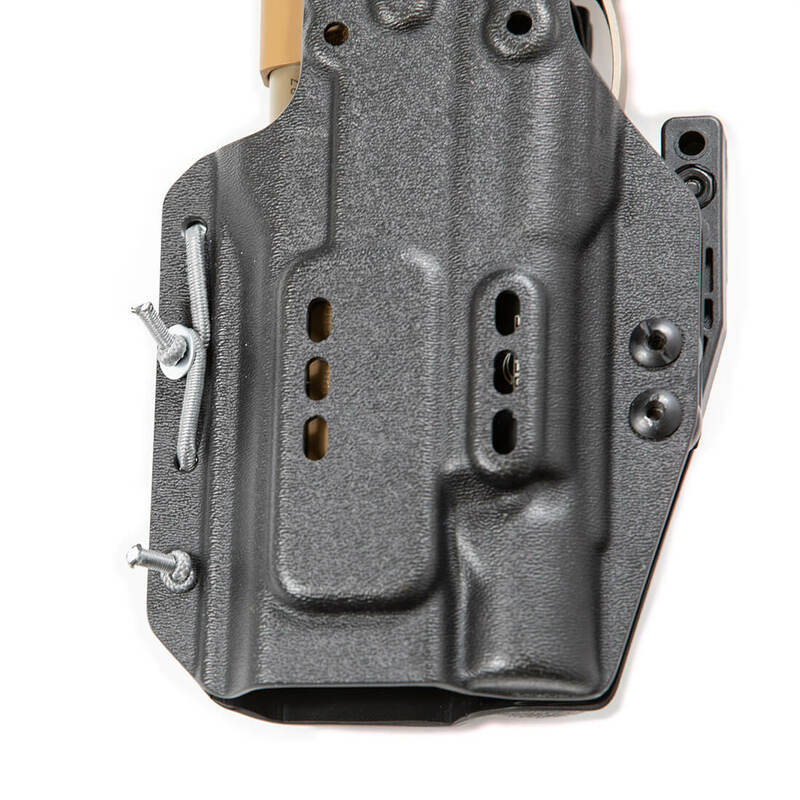 Reduced, lower-profile ergonomic molding improves comfort in a variety of carry positions and provides an ideal attachment point for your choice of aftermarket ergonomic wedge or DIY solution. 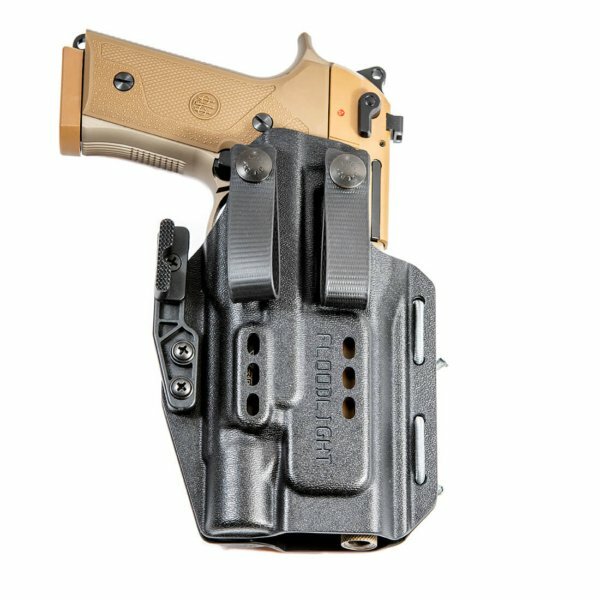 Like all of our holsters, the Floodlight accommodates muzzle devices, suppressor height sights, and slide-mounted optics.